Modic Changes - Spinal Disease Or Normal Finding? Modic Changes – Spinal Disease Or Normal Finding? Are Modic Changes A Specific Disease Entity? We have gone into details regarding antibiotics for back pain & how to determine if you may suffer from Modic changes, as well as frequently asked questions regarding the use of antibiotics for Modic changes type I. Let’s look at some of the evidence indicating Modic changes as a specific disease, rather than a normal finding of the degenerative spinal process. A 2001 issue of The Radiology Journal noted that both moderate as well as severe type I and II endplate changes produced pain with disc injection discography 100% of the time. A 2001 study in the journal Skeletal Radiology found an association between Modic changes and golf related low back pain, noting intradiscal steroid injections provided relief. Interesting study, however, only 4 patients were included. In the 2006 European Spine Journal, the authors did a study on Modic changes and noted that the results indicate that Modic changes with disc degeneration is “an entity on its own”, and that it is different from disc degeneration without Modic changes. The authors further suggest that individuals with low back pain and Modic changes might deserve having a specific back pain diagnosis. In a 2006 study in the German Journal RoFo, the authors noted that Modic changes in the endplate above the involved disc, especially those that are located in the center of the endplate, can indicate herniations that keep recurring and a sign of poor response to pain therapy. Another 2006 edition of Rofo noted that Modic changes, especially those in the upper (superior) endplate of a herniated disc predicts a poor outcome to epidural injections. Epidural injections are often recommended for degenerative conditions associated with herniations, however, when Modic changes are involved, this may not be a wise approach. Injections in the disc (intradiscal injections) have been shown to provide better relief when Modic changes are present. Since Modic changes are a dynamic disease, showing changes from one type to another, intradiscal injections are not curative, but may provide temporary relief. In the journal Spine, a 2007 study indicated Modic changes in the lower back, specifically at L5-S1 and Modic type I are significantly associated with low back pain & symptoms like sciatica, when compared to other locations in the lumbar spine as well as other types. A 2007 study in the journal of Arthritis & Rheumatism found that high serum High-Sensitivity C-reactive protein (hsCRP) was able to differentiate Modic 1 changes from Modic 0 and 2; averaging 4.64 mg/liter for type I, compared to 1.33 mg/liter for Modic 0 and 1.75 mg/liter for Modic II. A 2007 European Spine Journal study found that Modic 1 changes showed a tendancy to increase in frequency, are more associated with pain than Modic type II, and are strongly related to disc herniations in a 14 month follow up study. Therefore, those with lumbar disc herniation is a risk factor for developing painful Modic 1 changes during the following year. A May, 2008 issue of the American Journal Of Radiology indicates Type I Modic changes are most likely inflammation and appear “strongly associated with active low back symptoms and segmental instability”. The journal of Med Hypotheses in 2008 notes Dr. Albert and colleagues propose two pathogenic mechanisms for Modic changes: Mechanical Modic changes: The consequences of disc degeneration increase sheer forces on the endplates, resulting in microfractures and inflammation or leakage of toxic nuclear material through the microfractures. Infectious: Annular tear and subsequent herniation resulting in nuclear neovascularization, through which anaerobic bacteria find a pathway into the similarly anaerobic disc, thus producing a low virulent infection surrounded by resultant edema and inflammation. The authors note that painful subchondral marrow signals are seen with spinal infections, osteoarthritis, as well as autoimmune diseases like spondyloarthritis and ankylosing spondylitis. Vertebral Modic changes are seen in relation to spondylodiscitis, fractures, severe degenerative changes, chymopapin injection, herniation and acute Schmorl’s nodes. Proposed methods of treatment for Modic changes would be related to the underlying cause, like specific rehabilitation programs, rest, surgery or antibiotics. A 2009 edition of the journal Radiology studied almost 2,500 discs, indicating that Modic type I changes are highly predictive of a pain generator. The term “highly predictive” is one that is not used lightly and must be supported by the evidence. This indicates that Modic type I changes are very likely to be the cause of pain. The 2010 issue of the European Spine Journal studied what factors predicted the development of new Modic changes and determined the factors were related to the dynamics and status of the disc rather than the result of lifestyle factors like physical loading, smoking or gender. A 2010 European Spine Journal studied pyogenic spondylitis in Modic 1 patients that had no signs of infection for 2 years. They considered the relationship between the two entities. They did frequent follow up studies including imaging and blood profiles indicating no abnormal blood profiles. It should be noted they performed C-reactive protein and not High-sensitivity C-reactive protein. Nonetheless, they noted in the 71 patients with Modic type I changes and without other signs of infection, pyogenic spondylitis was confirmed in 3 patients (4.2%). Noteworthy was 2 of the 3 had diabetes. The authors state this indicates it is important to consider pyogenic spondylitis prior to Modic 1 treatment. In the May 2011 issue of Medical Hypotheses, the authors propose Modic 1 changes to result from an autoimmune reaction of the nucleus pulposus that has breached the endplate due to disruption from chronic and repeated shear forces. The subsequent outer annulus breach and production of inflammatory cytokines from the vertebral body in contact with the nucleus pulposus represents an autoimmune response resulting in bone marrow vascularization and edema, characteristic of Modic 1. They further postulate that clinical methods may used to circumvent this pain pathway. A 2012 study in BioMed Central Medicine Journal found that exercise, a primary recommended therapy for back pain according to most standards, was not effective for those suffering from Modic changes. A 2012 issue of the Global Spine Journal indicated that individuals with Type I Modic changes had a poor response to lumbar discectomy than those with Type II 1 year following discectomy, with higher rates of disability. A 2012 edition of the European Spine Journal indicated, in a 14 month study, that Modic type I changes during the initial diagnosis was associated with poor treat outcomes and persisting low back pain at 14 months follow up, regardless of change in size of the type I lesions. Does size matter? In a 2012 study in the journal Spine it was noted that size of Modic 1 lesions do not correlate with clinical symptoms. The main distinguishing feature for Modic lesions is the type, noting that when Modic 1 changes to a mixed M1/M2, clinical symptoms improve. A study in a 2012 Annals of Physical and Rehabilitation Medicine noted better acute response to intradiscal injection for disabling chronic low back pain Modic type I over Modic II. The effects did not last greater than 6 months. The authors indicated side effects from cortivazol and triamcinolone corticosteroid intradiscal injections reported as disc destruction after puncture and disc calcification, a very painful condition. The authors used acetate of methylprednisolone or prednisolone, indicating no reported side effects for intradiscal injection of these or corticosteroids. The authors indicate, “In contrast to other degenerative modifications of the spine, Modic type I changes are closely associated with chronic low back pain as suggested by observational studies”. They further note, “Taken together, our results and those of others strongly support the concept of a specific syndrome associated with Modic type I changes seen on MRI: worsening symptoms during chronic low back pain, inflammatory clinical and biological profile, and acute short-term response in pain level with intradiscal corticosteroid injection.” Part of their inflammatory profile refers to the 2007 study regarding serum elevated high-sensitivity C-reactive protein levels. A 2013 study in the European Spine Journal indicated Modic 1 changes are responsive to a 100 day course of antibiotics for individuals suffering from chronic back pain. This is the study that so many have questioned and complained about. Despite calls from the authors to perform additional studies regarding antibiotics for Modic 1 changes, controversy remains and, to my knowledge, no additional studies have been undertaken to disprove the remarkable results. The only further evidence is through individuals in Europe that have undergone the therapy. These anecdotal reports confirm the results of the study as many individuals are reporting relief from chronic pain due to these specific Modic changes, resulting from the course of antibiotic treatment. These reports indicate that, while not everyone is a candidate for antibiotic treatment due to lack of Modic Type I changes, or have adverse effects/allergies to the Bioclavid/Amoxicillin Clavulanate; and not everyone who qualifies will respond due to strictly structural Modic 1 changes, response is generally very good in practice. Dr. Albert has made a significant contribution to the treatment of chronic back pain and disability. A 2013 study in the European Spine Journal noted Modic type I changes related to a herniated disc may be due to inflammation surrounding an infected disc, finding Modic changes associated with discs that are infected with bacteria, as compared with those discs that are not infected. The 2013 issue of Biomed Research International performed a study where they removed material from disc herniations. Their in-depth study was concluded by noting, “… the role of P. acnes in lumbar disc herniation should not be readily dismissed”. In the 2013 publication in Advances In Orthopedics, 88 patients received posterior dynamic stabilization surgery for chronic disc degeneration with Modic types I and II. This was a successful procedure for both types. The authors of this study stated that Modic 1 changes are associated with painful disorders connected with instability and painful disorders connected with instability. Although both types responded well to the surgery, Modic I were more unstable than Modic II, although Modic II can be associated with radiculopathy. A 2013 issue of the Global Spine Journal noted in one of the largest population based studies, the findings of the authors indicate that Modic changes are “clearly associated with disc pathology” (degeneration, bulges/extrusions) …”and endplate abnormalities” (Schmorl’s nodes). A 2013 issue of the Journal Of The Korean Neurosurgical Society studied Modic changes in the thoracic spine, finding them differing than cervical and lumbar spine in type and frequency, but noticing a strong relationship between thoracic Modic changes and disc herniation. It is known that P. acnes is a problem with shoulder joint infections and device implant failures post-surgery. In a 2013 article titled, “Propionibacterium acnes: an underestimated etiology in the pathogenesis of osteoarthritis?”, the authors hypothesize that cycles of relapse and remitting pain in osteoarthritis is possibly related to bacterial flare-ups in the affected joint. In the European Spine Journal, 2014, a study indicated heredity as a factor in Modic changes, indicating the heredity factor was approximately 30%. This is not surprising, considering the heritability associated with degenerative disc disease. So, with a family history of back problems, it may be a good idea to pay extra attention to avoid problems associated with chronic back pain. In the 2014 edition of the journal Spine, a study indicated that disc herniations that occur when Modic changes are present respond poorly to conservative treatments and are less likely to reduce in size without surgery, showing greater signs of endplate involvement. A 2014 issue of Postgraduate Medical Journal indicates that there may be an infective component involved indicating this may indicate “novel potential treatments” for those suffering chronic back pain not responding to other therapies. The 2014 paper in Skeletal Radiology studied patients with radiculopathy due to a herniated dic, with and without Modic changes, for a period of 1 year. The results indicated Modic 1 changes can prolong sensory pain recovery in subjects with disc herniation related lumbar radicular pain. In a 2014 issue of the European Spine Journal, Dr. Adams and colleagues noted that a herniated disc can pull away some of the underlying bone, thereby opening a pathway between the disc and bone, which can lead to inflammation of Modic 1 changes in the endplate and infection by bacteria in the disc. A 2014 issue of the Global Spine Journal indicates that endplates are especially vulnerable to damage, and can cause communication between inflammatory disc chemicals with bone marrow. Damage to the endplates can be areas of “reactive bone marrow lesions” including abnormal nerve growth that is pain sensitive. The authors indicate the role of this type of endplate damage in back pain is under-appreciated due to the lack of clarity when visualizing diagnostic imaging. A 2014 study in the European Spine Journal noted the effects of Modic changes in the cervical spine, indicating Modic changes in the neck were found in association with degeneration and stenosis – narrowing of the spinal canal. They also found altered angular motion in segments with Modic changes indicating restricted motion in cervical spine segments afflicted with Modic changes, which is opposite the findings of instability or excessive motion in the lumbar spine. In a 2014 study in Spine, the authors noted higher disc degeneration and Modic changes with irregular endplates compared to concave or flat shaped endplates. They indicated Modic changes exhibited less angular motion with increased translational motion, relating pathological motion of the spine in relation to endplate shape and remodeling via kinetic MRI study of 2100 lumbar motion segments. In the 2014 issue of the Spine Journal, the authors followed back pain patients over 1 year who were on sick leave for back pain and compared MRI findings, noting the only MRI finding associated with failure to improve symptoms and return to work were those with Modic 1 changes. A case study presented in the 2014 journal of Skeletal Radiology, where the authors used intradiscal injections (inside the disc, not epidural) to treat a patient with Modic type I changes indicated total relief after 2 injections in the disc. Six months later, an MRI showed that the Modic type I had changed to Modic type II. A year after the first injections, the patient again experienced back pain and MRI revealed Modic type I changes that were worse than the first scan. (Not sure if it was an increase in grading and/or frequency, term used was “stronger”). Two more injections in the disc were administered which again relieved the pain. Six months later, MRI indicated changes back to Modic type II. The authors indicate Modic type I changes to be reversible local inflammation. This provides some evidence that intradiscal injections are preferred to epidural injections when Modic changes are involved, and that these injections are not curative, but do show positive results. In the 2014 European Journal of Radiology, a scientific study was published indicating 346 individuals with symptoms directly related to lumbar disc herniation were significantly less likely to respond to imaging guided lumbar nerve root blocks if they had Modic changes. This is in basic agreement with biopsies done by Dr. Modic and colleagues, where type I were considered fibrovascular tissue, like fluid from a boil, indicating very active degeneration. Type II being a more stable, but chronic process with fatty replacement in the marrow, and type III being the most stable form with scar tissue or thickening. A 2014 study in the Chinese Medical Journal noted that lumbar disc herniation with Modic changes and mainly back pain responded better to discectomy and fusion, rather than discectomy alone. This provided further evidence of the unstable nature of Modic endplate changes in that patients presenting with these changes respond more favorably to stabilizing fusion after discectomy as opposed to disc herniations without associated Modic changes. In the 2014 issue of Trials, a prospective study involving pamidronate, a class of drugs called bisphosphonate, for Modic 1 changes is proposed for undergoing a trial. The authors note Modic 1 changes as “erosive degenerative disc disease”, with back pain relating an inflammatory pattern of pain, similar to diseases known as spondyloarthropathies like rheumatoid arthritis, ankylosing spondylitis and pain producing bone diseases like vertebral fractures and fibrous dysplasia, Paget’s disease. They are proposing a clinical trial of intravenous pamidronate. While this may be effective for some, this is serious medication with serious side effects. This is similar to a previous study using zoledronic acid, another biophosponate, where 95% of those taking experienced side effects. Improvement was noted, however, there was a small number of participants with Modic changes. Curiously, a history of studies involving Modic changes was outlined, however, no mention of Dr. Albert’s work with antibiotics was noted in this proposed trial of therapy for Modic changes. The results of the study were published in a 2014 BMC Musculoskelet Disorders, where it was indicated that treatment reduced the intensity of low back pain short term as well a reduction of NSAID use over a one year period. Side effects prominent were fever, flu like symptoms and joint pain. In studying Modic changes, sometimes we will need to move beyond terminology. We know that Modic changes are diagnosed according to type. This is important in doing research and finding specific therapeutic measures, in consideration of the differences among types of changes on a subjective and objective basis. Understanding that diagnosing type depends on the MRI machine used. Low field MRI units are better at determining which type of Modic change exists. Some MRI machines will not show Modic changes. With the advent of high field units, classification of type becomes obscure and is generally noted as “endplate signal changes” or “reactive endplate changes”. While this does not allow typing and is insufficient for determining specific parameters relating to diagnosis and treatment of a particular type, it is sufficient to document the existence of Modic changes. A 2014 study in the Korean Journal of Spine indicated surgical fusion rates for those with Modic endplate degeneration changes were significantly lower than those without endplate degeneration. Regardless of Modic type, fusion was about 50%, however, without Modic changes, fusion rate was about 90%. Adding Alendronate (Fosamax), a bisphosphonate used in treating osteoporosis and indicated to possibly retard degeneration, had no effect on outcomes. Therefore, Modic changes suppress the fusion process for those undergoing Single Level Posterior Lumbar Spinal Interbody Fusion (PLIF). Nonetheless, we are continuing to find evidence that Modic changes are a specific type of spinal disease regarding back pain. In the 2014 issue of the Spine Journal, it was clearly indicated that disc degeneration by itself is not associated with back pain relating to MRI findings, however, when combined with “endplate signal changes”, they are “highly associated with low back pain”. An article published in the 2014 issue of PLoS One, they compared Modic changes in the lower back and neck of over 3,000 patients. They noted that the occurrence of Modic changes is “significantly higher” in those with neck and back pain. The authors defined Modic changes as “degenerative changes of the vertebral endplate”, and that they are related to minor endplate trauma due to repeated loading, or repeated injury to the disc. They also noted the inflammatory nature of Type I indicating “vascularized bone marrow and/or edema” (actually, neovascularization more accurately describes the infiltration of the marrow with blood vessels and unmyelinated or hypersensitive nerve fibers), type I “fatty change or necrosis of the endplate (this would be fatty degeneration of the bone marrow and cell death of the endplate), and Type III “endplate sclerosis” (scar tissue). The authors additionally state, “Furthermore, clinical evidence suggests that Modic changes are often observed in people with neck pain” and indicate endplates are the “weak link” in the spine, which are subject to irreversible injury from repetitive or excessive loading. The endplates assist with vital nutrient transport to the disc and damage can result in loss of this nutrition and resulting accelerated degeneration. Since the neck is biomechanically subject to less loading than the lower back, Modic changes are more frequently seen in the lumbar spine than the cervical spine, however; both are directly related to spinal pain in their respective spinal locations. A 2014 issue of the European Spine Journal indicated a study where 21 discs were surgically removed from patients suffering low back pain or sciatica as a main symptom. Almost half of the discs contained cartilage that showed signs of being pulled off from the endplate during herniation. The authors indicate that disc herniations frequently contain cartilage peeled from the endplate. These cartilage pieces are not readily absorbed and can increase the risk of long term sciatica. Furthermore, it was stated that this loss of cartilage from the endplate creates a pathway in the cartilage for inflammation and disc infection. A 2014 European Spine Journal article studied the charachteristics of Modic 1 pain in 120 patients. The authors noted the presence of at least one of the three inflammatory pain patterns can be used as a screening tool to detect Modic 1 changes; 1) maximal pain on morning, 2) waking at night because of pain, 3) morning stiffness for longer than 60 minutes. 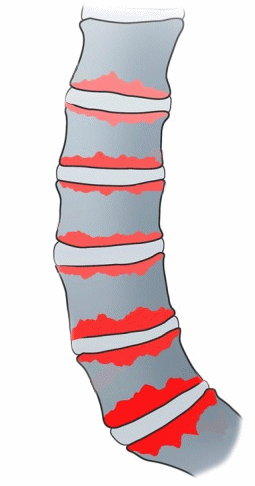 This is also a characteristic seen with ankylosing spondylitis. The authors also noted back pain with lumbar extension was associated with Modic 1, and the side of pain was associated with the side of the lesion found on MRI. They also indicated sedentary work was a protective factor, however, lowering loading and daily rest does not appear to be an effective strategy. They noted better results with oral steroids than NSAID’s. A 2014 study in the American Journal of Neuroradiology used diffusion-weighted MRI (DW-MRI) to differentiate infectious from degenerative Modic changes type I. They found that a visible “claw sign” indicated degenerative changes, while the absence of this claw sign “…strongly suggests diskitis/osteomyelitis. The absence of the claw sign predicted osteomyelitis 100% of the time in 14 of 14 patients. I was very interested in this study titled, “Diffusion-weighted MRI “claw sign” improves differentiation of infectious from degenerative Modic type I signal changes of the spine”. Finally, a clear way to diagnose the difference. For a time, I recommended DW-MRI for Modic change diagnosis. All were showing claw signs? Perhaps since Modic changes represent a low-virulent infection, the distinction is not that simple. Well, I corresponded with one of the authors, Dr. Tanenbaum, to try to clarify this. He indicated, “…claw represents a border zone induration as a response to a slow degenerative process. Infection is presumed to advance more rapidly and thus not manifest the striking border zone changes. I would assume it applies to all infections but more experience is needed”. On further questioning, he stated “My presumption is that type I changes are more indolent Than infection and thus create the claw”. Thus, a claw sign may still represent Modic 1 changes related to bacterial infection. However, this would differentiate symptomatic Modic 1 due to osteomyelitis from Modic 1 structural or bacterial related, an important finding related to emergency treatment and possible lives saved, considering some of the grave consequences of osteomyelitis. We do know from a previous 2010 study, that 4.2% of Modic 1 patients were diagnosed as having pyogenic spondylitis, even without signs of infection. Perhaps in those with diabetes, DW-MRI would be prudent. A 2015 issue of the journal Spine studied the difference between high and low field MRI for degeneration in the lumbar spine. They used low field (0.25T) and high field (1.5T or 3.0T) MRI systems. They found that there was very good agreement between disc herniation, foraminal, central canal and lateral recess stenosis and nerve root compression. However, no mention of Modic changes was noted. The authors indicated the low field produced more artifacts from motion, presumably due to longer scanning time. We know 3.0T systems are not good for Modic changes, however, they could have included reactive endplate changes. Thus, we will see more general descriptions of Modic changes as high frequency units are being promoted as better than low field. In my experience, high field units may show greater detail regarding disc herniations or extrusions, however, noting Modic or endplate changes without the ability to type these changes is a distinct disadvantage for those suffering particularly from Modic Type 1 changes; the most painful and inflammatory type. When Modic Type I changes are suspected via history, a low field MRI unit should be used in order to recommend treatment; antibiotics have only been proven to be effective for Modic Type I, and to document objective findings related to a patient’s complaints for medical and/or medico legal purposes. If Modic 1 changes were found, would there be clinical reasoning for prescribing exercise, or would this be contraindicated? Are you doctors prescribing physical therapy paying attention? Are you P.T.’s paying attention? Or just getting paid? Would even a more generalized “reactive endplate changes” provide clear evidence for a pain generator and/or offer an explanation for chronicity other than central sensitization? Maybe if we use 3.0T units, Modic changes will just go away! The authors of the above study indicate high field is just as good as low field for “most” findings in degeneration; perhaps suggesting high field is better due to less motion artifacts, while ignoring what is probably the best finding in relation to chronic back pain from degeneration. A 2015 study in Cell Biochemistry and Biophysics found patients with lumbar herniated discs that were treated conservatively for 6 months were less likely to have the disc heal when Modic changes of the endplates were present. This relationship was noted by the authors as “strong”. The authors further indicated those with Modic changes had significantly more cartilage in the herniated disc tissue along with less vascularization and macrophage levels, which helps explain delayed healing. A review was published regarding back pain in relation to low grade bacterial infection in a 2015 BMC Medicine Journal . The authors reviewed the literature and determined there was a moderate level of evidence indicating back pain due to Modic 1 change with disc herniation and bacterial infection regarding causation as well as relationship. The authors indicate a greater understanding regarding the evidence from the study by Dr. Albert is necessary to justify a change in practice. They further reiterate significant concerns regarding antibiotic resistance. They additionally call for more studies, something Dr. Albert has called for years previous in her original study. I think time and resources would have been better spent actually doing a study rather than a review of studies already done. There will always be suspicion of cross contamination. The issue of antibiotic resistance has been addressed regarding this self-limiting process again and again. Evidently, the need to unnecessarily alarm and revisit this issue will be a never ending process, regardless of the status of the evidence and the nature of this moderately evident disease process. If they are not going to do studies, a theory should be posed as to the results of Dr. Albert’s study and a new mechanism proposed for the specific antibiotic (Augmentin/Bioclavid) producing such results in a specific population group. I guess we need absolute evidence to consider a change in thinking for a specific group of back pain sufferers. You would think they were talking about anyone with back pain. We know it is a group of patients with chronic back pain, a specific history, suggestive subjective findings, along with very specific objective findings. Perhaps if they are looking for a greater understanding of the evidence, they should have taken her certification course instead of looking at search strategies. It would seem the number of Modic Antibiotic Spinal Therapy (MAST) clinics, as well as their success in treating these patients have indicated the evidence is clear and practically justified. The Royal Australasian College of Surgeons published a review in the 2015 ANZ Journal of Surgery. They reviewed current literature about the hypothesis on bacterial infection causing disabling lower back pain and radiculopathy. It is a very interesting article and well done, however, most of the article tries to relate consensus regarding cultures of bacteria, for which there are none. A nice review of the techniques and conflicting results, however, no conclusion can be drawn. They seem largely focused on herniated discs, while relegating Modic changes as a possible, unproven relation. They state, “Low-grade anaerobic bacterial infection of the intervertebral disc is a hypothesis that has challenged the status quo of the pathogenesis and treatment of lumbar disc herniation.” I do not know of anyone proposing antibiotics for disc herniations. 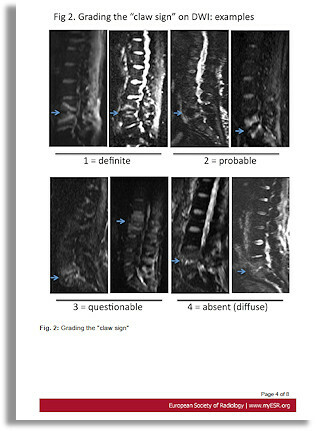 The protocol used by Dr. Albert had strict criteria, including those with a specific subset of disc herniation related to a specific subset of Modic changes, related to specific clinical and history subjective/objective findings. Understandably, the authors state, “..antibiotic resistance is a major developing problem around the world and, if used inappropriately, the proposed 100-day course of oral amoxycillin/clavulanic acid has the potential to greatly influence this increasing level of resistance further. Therefore, sufficiently accurate diagnostic tools would be needed to prevent patients complaining of back pain associated with lumbar disc herniation from unnecessarily protracted courses of antibiotics prior to considering surgery.” I would agree, should the assumption be treating everyone suffering disc herniations with antibiotics, however; revisiting this, for what is proposed as a very specific subset of chronic back pain patients with a self limiting disease is not contributing to anything, but needless alarm. Similarly, the pros and cons of current culture methods also is non-contributory. Obviously, new techniques need to be developed and we can argue about conflicting results till then. They further state, “More specific predictive factors and factors that could be used at the time of diagnosis are needed before a protracted oral antibiotic regime could be considered for use beyond the research field.” Well, there are specific subjective and objective findings already being used successfully, beyond the research field, into direct clinical practice. Additionally, they conclude, “Promising results in support of the disc infection hypothesis have been published, but it is obviously too early to drastically alter one’s practice.” I am not sure of who is demanding a drastic alteration in anyone’s practice. I do not think it is asking too much to consider a course of antibiotics should a patients history not contraindicate antibiotic use, and specifically indicate a correlative history, along with both subjective and objective findings typical of one suffering from chronic, disabling Modic 1 related back pain, with or without radiculopathy. I don’t think this self limiting disease poses a threat to a global antibiotic resistance disaster. The authors conclude, “Although definitive evidence is lacking, the disc infection hypothesis has the potential to cause a paradigm shift in the approach to back pain caused by HNP [herniated nucleus pulposus] and as such should not be dismissed lightly.” I think they have done a brilliant review, however, their premise is misguided. It should not be dismissed lightly in consideration of Dr. Albert’s double blind study and the numerous and growing Modic Antibiotic Spinal Therapy Centers treating a very specific subset of disc herniation. Motion characteristics of Modic changes in the lumbar spine were featured in a 2015 Journal of Neurosurgery Spine. The authors studied 450 patients with back symptoms focusing on the biomechanics of Modic changes as compared with other conditions using a special weight bearing kinematic MRI. They found a significant association between increased translational motion (instability), especially with type I, and a decrease in angular motion in accordance with increasing Modic changes. The authors indicated Modic changes, a disorder of the endplates, may significantly impact segmental spinal stability. A 2015 study in the European Spine Journal found that osteoclast activators are elevated in discs with Modic changes. The study involved disc specimens from herniated disc tissue. The authors noted the relationship between the cytokine tnf-α and Modic changes. The authors indicated factors secreted by disc tissue stimulates osteoclasts, and this is involved in the process of Modic changes. Osteoclasts break down bone, degrading bone matrix and dissolving mineral. Normally, there is a homeostasis between the activity of osteoclasts and osteoblasts, which build bone. An imbalance in this mechanism can result in conditions like osteoporosis. This is an interesting article that begs further study. Tnf-α can cause formation of osteoclasts. It is produced in reaction to toxins by pathogens or immunological substances and is related to rheumatoid arthritis, an inflammatory and destructive bone and cartilage disease. This could also relate to a problem with the bone marrow cells which inhibit osteoclast formation or tnf-α mediated destruction of osteoblasts and interference with their differentiation. So, we are looking further into Modic changes and the relationship between their known association with tnf-α, bone marrow changes and inflammation. Of note, in a 2015 study in the German journal Zeitschrift für Orthopädie und Unfallchirurgie, the authors focused on adjuvant antibiotic therapy for spondylodiscitis cases treated surgically. The prominence of age distribution was significant for 60 to 80 year olds, 55% in the lumbar spine. 60% of the patients had not been diagnosed or received any treatment for 1 month. Almost 50% had coexistence of diabetes mellitus. A 2015 study in Spine indicates that high levels of multifidus muscle fat infiltration was related to severity of back pain and disability, while high levels of fat infiltration of the erector spinae muscle was related to decreased disc height and Modic changes. This is an interesting finding and the authors postulate a possible cause or effect relationship in regards to structural features of disabling low back pain for future studies. Fatty infiltration of paraspinal muscles is a known degenerative feature of spinal disorders. Previous studies have indicated this in osteoporosis, facet joint arthrosis and whiplash injuries with poor functional recovery. I have not seen a correlation between this and Modic changes previously. A causal relationship seems unlikely, however; it is reasonable to assume an effective relationship at this point, as well as an area of interest in the future, perhaps another factor related to MRI field sensitivity. A 2015 study in the journal Spine followed twins for 10 years and indicated that Modic changes are an independent risk factor for episodes of severe and disabling back pain. The authors call for additional studies to identify the histology of Modic changes. A 2015 study in the American Journal of Roentgenology found that patients who underwent microdiscectomy for herniated disc with surgically confirmed endplate cartilage herniation were associated with Modic changes on MRI. Modic changes were located at mid endplate level and posterior corners. Other MRI findings associated with cartilaginous endplate disc herniation were posterior osteophytes, posterior marginal nodes, mid endplate irregularities and extruded material with a heterogeneous low signal intensity. In 2015, a study in the journal European Radiology investigated long term improvement of pain reduction with indirect cervical nerve root blocks while comparing MRI findings at the location of steroid infiltration. Those with compression of the nerve root had good long term outcomes, while those with extrusions showed less improvement and were four times more likely to undergo surgery compared to those with protrusions. The authors further noted, “There are less improvement in patients with Modic type I changes”. A 2015 review and meta-analysis in the journal Spine sought to determine a possible relation between low virulent disc infection and development of symptomatic disc degeneration. The authors did a comprehensive search using six electronic databases and concluded “…the possibility that disc infection may be linked with disc degeneration should not be ruled out”. They noted those with symptomatic disc degeneration were 6 times more likely to suffer from a disc infection, the major culprit being Propionibacterium acnes. A 2015 study in the European Spine Journal found Indian Hedgehog (ihh) protein was positively correlated with severity of cartilage degeneration in both types 1 and 2 Modic changes. Indian Hedgehog signaling is related to tumorigenesis and arthritis; as serum levels have been found to respond to anti-tnf-α therapy in ankylosing spondylitis, affecting functional target genes in the Hedgehog expression pathway. A 2015 review in Annals of the Rheumatic Diseases suggests Modic 1 changes to be a particular “phenotype” or “biomarker” of non-specific chronic low back pain, and an anatomical lesion with specific biological, radiological and clinical features. The authors indicate an active discopathy with local inflammation related to predisposing genetic factors and biochemical or mechanical stress, as well as local infection. The authors indicate Modic 1 changes are of “high clinical relevance”. A 2015 study in the journal Orthopedics followed over 1200 patients who had microendoscopic discectomy for disc herniation, over a period of 10 years. Significant risk factors for re-operation, in addition to the level of degeneration and degeneration next to the level of microdiscetomy, those with Modic type I were almost 15% more likely to require re-operation within the period observed than those without. For Modic type II, only about 4% difference was noted. A 2015 European Spine Journal study found that Modic 2 changes had a significant impact on axial pain symptom intensity at one year follow up for those undergoing single level anterior cervical discectomy with fusion surgery, and also negatively influenced adjacent segmental degeneration. A 2015 study in the journal BMC Musculoskeletal Disorders used lumbar facet joint injections to see if Modic changes would effect outcomes of this therapeutic approach. Although the patients were not diagnosed as having facet joint pain nor pain from Modic changes, the authors noted approximately 40% of patients without Modic changes had clinically relevant improvement, whereas approximately 33% with Modic changes had improvement 1 month after injection. They noted a tendency for better outcomes in those without Modic changes for a non-specific diagnosed group of patients, using a technique usually reserved for specific diagnoses. Very curious study. In yet another attack on MAST (Modic Antibiotic Spinal Therapy) is presented in a 2015 Discovery Medicine Review. While the authors indicate the growing interest in antibiotics for symptom producing disc degeneration, they indicate, “… the notion that subclinical anaerobic bacterial infection could play a role in symptomatic disc degeneration”. I think a review of the literature above by any reasonable scientist suggests more than a “notion”. Another attempt to massively expand what is a specific subset of back pain sufferers. The authors indicate Dr. Albert’s study is “…is one of the most strikingly successful experimental treatments for LBP [low back pain] to date.” I agree, however, they proceed to indicate “shortcomimgs”, and “possible confounding effects of amoxicillin-clavulanate.” They indicate evidence of clavulanic acid’s anti-inflammatory effect in ulcerative colitis and it’s analgesic effects in mice undergoing morphine withdrawal. However, Dr. Albert chose this based on recommendations from well noted microbiologists as the antibiotic of choice with the least ant-inflammatory effect. Additionally, it does not explain the long term effects, many months and in cases years after the antibiotic has been stopped. Perhaps more information is forthcoming with a clinical trial on antibiotics & Modic changes using a single dose amoxicillin, without clavulanic acid. Again, these authors revisit the “antibiotic resistance” controversy; something that has been addressed ad infinitum here and elsewhere, however, it must be the politically correct thing to say in order to maintain the controversy. Evidently, in their conclusion, the authors are concerned that antibiotics should not be the only focus of attention for inflammatory back pain conditions. Honestly! Who would have guessed there were other causes? Metabolic syndromes? Aberrant mechanical loading? I don’t mean to be facetious here, it is a very well written and informative article; the authors do a great job of indicating mechanisms of disc inflammation, along with a fantastic graphic on signaling pathways. I very much enjoyed reading it. However, it could have done without the obvious negative references to Dr. Albert’s work. A 2015 study in the European Spine Journal found that disc samples obtained from patients undergoing discectomy indicated that the bacteria P. acnes is found significantly more in herniated discs with annular tears than in those without annular tears. The authors indicate from control muscles samples that a true infection is far more likely than previously indicated contamination. This indicates that P. acnes (Propionibacterium acnes) can access the disc via tears in the annulus fibrosus. 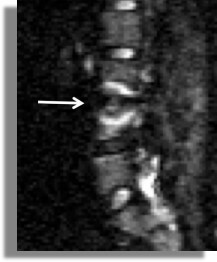 A 2016 review in the European Spine Journal noted bone marrow lesions seen on MRI as Modic changes present a high specificity for low back pain of disc origin. The authors indicate that Modic types indicate stages of the same pathological process, characterized by inflammation, high bone turnover, and fibrosis. They indicate a disease model where predisposing factors are related to an autoimmune response to disc material or discitis. Regarding treatment, the authors indicate no consensus and relate non-surgical options as antibiotics, intradiscal injections, bisphosphonates, and anti-TNF-α; antibody. The authors concluded, “Modic changes are likely to be more than just a coincidental imaging finding in LBP patients and rather represent an underlying pathology that should be a target for therapy. In a 2016 International Orthopaedics review, the authors indicate Propionibacterium acnes to be an opportunistic pathogen causing infections, such as joint and bone infections, implant device infection, central nervous systems infection, synovitis, osteitis, hyperostosis, as well as acne, pustulosis and prostatitis. It is also strongly correlated with spondylodiscitis, pyogenic discitis and vertebral osteomyelitis. The authors noted possible routes for disc inoculation related to Modic changes: 1) Via the circulatory system when skin or mucosa is broken and neovascularization is found around a disc when the annulus fibrosus is breached. (2) Via the circulatory system where macrophages devour P. acnes, transport into intervertebral discs and release viable bacterium upon cell death. They indicate macrophages aggregate around the ruptured annulus after disc herniation where some may contain devoured bacteria. The authors related candidates for antibiotic therapy should; (1) Have low back pain for greater than 6 months with failed exercise therapy; (2) more than 1 or 2 years with a herniated disc; (3) Modic type I changes at the level of the herniated disc. They further suggest rifampicin as an alternative or in combination with ß-lactam antibiotics, such as amoxicillin, due to its effectiveness against P. acnes and its capabilities for soft tissue and bone penetration. A 2016 pilot study in Biomed Research International isolated P. acnes from a Modic 1 disc and inoculated discs of rabbits. The P. acnes group developed Modic 1 changes along with degeneration. They also inoculated S. aureus into the rabbit discs. Comparing the results, S aureus discs showed typical signs of a pyogenic infection, while the P. acnes displayed a latent low grade chronic inflammation. The authors postulated varying degrees of virulence with different species of P. acnes. The S. aureus rabbits displayed pyogenic discitis consistent with spinal infection where we commonly see fever, body weight loss, and abnormal ESR. S. aureus rabbits also displayed higher death rates. A 2016 study in the Journal of Manipulative and Physiological Therapeutics applied spinal manipulation to patients with disc herniations and Modic changes. The noted improvements in patients with Modic Type II was significantly better than those with Type I. The authors noted that Modic 1 patients were significantly less likely to indicate improvement at 1 year; attributed by the authors to being prone to “relapse”. Therefore, we continue to see evidence that symptoms of Modic 1 Changes are quite resistant to traditional therapies. There is no indication of follow up MRI at 1 year. It is also not clear if relapse indicates specific exacerbation of chronic disc herniation or a relapse in symptoms related to inflammatory fibrovascular tissue, which implies improvement within maximum benefit at some point. A 2016 study in the Journal of Orthopaedic Research isolated P. acnes from a human disc with Modic 1 changes was injected into discs in rat tails. Within 14 days, fibrotic tisue was absorbed into the bone marrow, TNF-α was identified at the marrow/disc junction, and MRI revealed Modic 1 like changes in the bone marrow. The authors concluded that P. acnes proliferates within the disc and induces reactive degenerative marrow changes visible as Modic 1 changes. A 2016 study in the journal Medicine related specific findings or imaging biomarkers in Modic changes to low back pain of a prolonged and severe nature as well as disability. The authors found type II to be more than twice as prevalent as type I. In general, Modic changes were found in those who were older, had more disc problems, and more disc degeneration than those without Modic changes. Where the standard grading system is based on the depth of changes on MRI, this study found the length of visible changes were significant; with changes along 2/3 or greater of the length of the vertebral bone to be correlated to more prolonged severe lower back pain and disability. They found Modic 1 was more strongly associated with pain than type II, and a greater number or frequency of Modic changes found increased the above associations. A 2016 study in European Spine Journal found at 1 year follow up that persisting Modic 1 changes with a decrease in disc height and an increase in endplate lesions are associated with persisting pain, disability, and may be signs of prolonged chronic low back pain with a deforming degenerative process. Therefore, the authors indicate this should be a factor leading to specific treatments and early intervention that can affect the process. A 2016 study in the Spine Journal examined inflammatory chemicals called cytokines and Modic 2 changes. They found a significant increase in many of these cytokines associated with Modic 2. The authors stated “These results further strengthen the association between MCs [Modic changes] and low back pain”. It should be noted that Modic 1 changes are significantly more associated with inflammation than Modic 2. A 2016 study in PLoS One evaluated discs using biofilms and found an 11% prevalence of abundant P. acnes in 290 patient discs undergoing surgery for herniations. The authors introduction noted Propionibacterium acnes to be a slow-growing, fastidious, gram positive, facultative anaerobic bacteria found in acne, device related and post-operative infections. P. acnes have additionally been withing in the gastrointestinal tract, oral cavity, genitourinary tract, external ear canal, conjunctiva of the eye, and may also play a role in conditions, like prostatitis, sarcoidosis, SAPHO (Synovitis, Acne, Pustulosis, Hyperostosis and Osteitis – an auto-inflammatory disease), and degenerative disc disease. A 2016 article in the journal Future Science OA follows the progression of Modic changes from an innocuous “normal finding” of degeneration, to documentation of an infectious pathway in disc disease. The literature is reviewed in a clear, concise manner, indicating an “…imperative to continue researching the utilization of antibiotic treatment for this condition”. The authors elucidate the alternative to the mechanical/degenerative pathway. Bacteria of low virulence enter the disc after traumatic tears in the annulus or disc herniation. This process can tear fragments of the end plate which delays resorption of the herniation and causes neovascularization. Bacteria, most often different subtypes of P. acnes, are transported in the circulatory system from skin or nonskin origin that have the ability to colonize intradiscally. What follows is inflammation and rapid degeneration with end plate damage. Modic changes are seen on MRI and pain, often locally and 24/7, and disability result in many cases. The protocol of antibiotic therapy provides a 50% pain reduction in 50% of patients with Modic 1 changes following disc herniation. A 2017 study in BMC Musculoskelet Disorders compared Modic 1 changes with discs less tan and greater than 50% disc height. They found that those with less than 50% disc height tended to be young males at the L5/S1 level, while those with greater than 50% tended to be older females at the L4/L5 level, and associated with greater osteophyte formation. Th authors postulate whether this represents continuing stages of the same process or a specific phenotypic subsets of Modic 1. A 2017 study in the European Spine Journal examined the relationship between bone marrow and disc in Modic changes. The authors note Modic changes are bone marrow lesions that can be a diagnostic indicator for discogenic low back pain. The authors found pro-osteoclastic changes in discs of Modic 2, an inflammatory dysmyelopoiesis (aberrant morphology that can result in poor blood cell production) with fibrogenic changes in the marrow of both types, and up-regulation of neurotrophic receptors in the bone marrow and discs of both types (I & II). This give insight into the cellular processes and pain generating factors in Modic changes. In a 2017 Journal of Neurosurgical Science, the authors did a pilot study to see if Modic 2 changes are associated with low grade infections. They compared tissue cultures in patients having elective surgery for low back pain without Modic signs (23) to those with Modic 2 changes (16). Intra-operative culture examinations indicated positive results in 6 of 16 (37.5%) Whereas those without Modic 2 changes had positive cultures in 1 of 23 (4.3%). The study, although limited in scale, does support a hypothesis where some Modic 2 changes may be related to low virulent bacteria. A 2017 study in the Hong Kong Medical Journal examined data from 126 patients who underwent discectomy for lumbar disc herniation. 101 initial and 25 re-operation for recurrance. The authors examined criteria for recurrent disc herniation at a single L4/5 level. They noted a review of literature indicated recurrance rates between 5 and 15%. They noted body mass index, gender, age, smoking, diabetes mellitus, herniation type, preoperative radiological parameters Pfirrmann disc degeneration grade, disc height, Modic endplate changes, duration of symptoms and, surgical technique. Out of all factors considered, they found that greater endplate Modic changes, higher body mass index, and preoperative higher disc height are important factors in recurrent lumbar disc herniation. In a 2017 study published in the American Volume of the Journal of Bone and Joint Surgery, the authors studied the effects of direct inoculation of P. acnes in the spine from a rabbit model. They injected bacteria versus sham injection of a saline solutions. Modic change developments were investigated with MRI before the operation, 2 weeks, 1, 2, 3, and 6 months after the operation. Those receiving the P. acnes inoculation showed significantly increased signal intensities at 6 months. Positive cultures showed higher prevalence of Modic changes, significantly increased expressions for tumor necrosis factor-α, interleukin-1β, and interferon-γ following injection of P. acnes The authors concluded that low back pain and disc degeneration are associated with Modic changes and the study results indicate Modic changes can be associated with P. acnes. The authors of a 2017 study in the journal Spine induced Modic changes by injecting Propionibacterium Acnes into rabbit discs. This appears to be an extension of the above study with the exclusion of one author and going an additional 3 months. MRI evaluations were done at intervals up to 9 months along with tissue studies. At 4.5 months 11 of 20 discs were type I, at 9 months 9 of 20 discs were type II. T1 signals significantly decreased from 3 months, while T2 was significantly higher at from 3 to 4 months, then decreased dramatically at 6 to 9 months. Real time polymerase chain reaction indicated significant up-regulation of inflammatory cytokines in the endplates, while histological studies indicated abnormal endplates, disc degeneration, inflammation and micro CT confirmed bone resorption. The authors noted P. acnes is capable of surviving in the end plate and initiating inflammatory responses that present as type I and II Modic changes that are time dependent. A 2017 study in World Neurosurgery found that percutaneous endoscopic lumbar annuloplasty and nucleoplasty provided favorable outcomes for patients who did not respond to conservative treatments for disc related low back pain. However, it was noted that Modic changes were significantly related to poor results. A 2017 study in the Korean Journal of Spine found associations between Modic changes and degeneration of the cervical spine , predominantly type II at the C5/6 level. The authors noted those with Modic changes had a higher grade of disc herniation, increase loss of disc space and a greater loss of lordotic curvature. They also noted a significant greater likelihood of fusion surgery in those with Modic changes. A 2017 study in the European Spine Journal attempted to scrutinize the relationship between Modic changes and cervical spine instability, as well as the relationship to the normal lordotic curve and range of motion. The authors discovered. The authors found out of 464 patients observed, 94 had Modic changes, the most common location was the C5-C6 vertebral segment. They found instability was significantly higher in the Modic changes group. They also noted less curvature and motion range. They indicated cervical instability, less range of motion and curvature were risk factors for Modic changes. Cervical instability may result from cervical spine Modic changes. A 2017 study in the Journal of Pain Research noted axial neck pain is often reported by patients as pain, stiffness, or dullness. The authors indicate degenerative disc disease is a significant risk factor for axial neck pain. Discs, muscles, and facet joints may contribute to symptoms. Modic changes are frequently found in association with with axial neck pain. Cervical kyphosis, a reversal of the cervical spine affects spinal motion and may cause spinal cord compression. It is an important risk factor for advancing disc degeneration and patients with this condition are at risk to develop neck pain as well as neurologic deficits. The study found Modic changes are associated with axial neck pain in those patients with cervical kyphosis. A 2017 study in the Journal Of Orthopaedic Science found a higher risk of of pyogenic discitis, mostly Staphylococcus infection, after surgical laminectomy of the lumbar spine in those with Modic type I. Infection was related to the level of Modic I changes. The authors recommend pyogenic discitis, in which the usual symptoms are not yet manifest, should be ruled out carefully in patients with Modic type I to prevent one of the most serious complications following spine surgery. A 2017 study in the Asian Spine Journal found Modic changes in approximately 13% of the 809 patients population. The study identified genetic polymorphisms of MMP20 and VDR were significantly associated with Modic changes. The authors noted a previous study, where 831 twins indicated a 16-43% prevalence of heritability of Modic changes. The authors indicated the cause of Modic changes is still not known, and describe mechanical, infective, and biochemical theories. 1) With disc herniation and neovascularization, anaerobic bacteria can infiltrate into the endplates causing inflammation and edema. 2) Increased levels of inflammatory mediators, such as proinflammatory cytokines and interleukins have been detected in endplates, indicating an inflammatory cause. 3) With disc degeneration, increased stress on endplates results in fissures and microfractures which could be a major cause. A 2017 study in the European Spine Journal concluded the response of disc cells to the bacteria P. acnes is associated with the presence of Modic changes. The bone marrow cells displayed an inflammatory response to P. acnes metabolites and disc cytokines. The results indicated a low virulent P. acnes disc infection to be a possible exacerbating factor to Modic changes. Another 2017 study in the European Spine Journal found an association between latent Propionibacterium acnes infection and chronic inflammation in degenerated discs, primarily in the disc containing visible bacteria, manifesting in increased numbers of neutrophils and cytokines. There was more severe degeneration in discs with P. acnes postulated to be from and bacterial induced inflammation. A 2018 study in Emerging Microbes & Infections found that P. acnes induces intervertebral disc degeneration by promoting nucleus pulposus cell apoptosis, concomitant with severe intervertebral disc degeneration. P. acnes was found to activate autophagy, likely to play a role in apoptosis of nucleus pulposus cells. Their findings validated the involvement of P. acnes in the pathology of disc degeneration, providing evidence that P. acnes induced nucleus pulposus cell death is likely responsible for the pathology of degenerative disc disease. A 2018 study in the European Spine Journal found that positively charged antibiotics penetrate the disc better than negatively charged ones for treatment of low virulence disc infections. The authors (15 of them!) found clindamycin penetrated the disc better than cefazolin. Let me get this straight, they are “excited” that antibiotics may treat disc disease? Where have they been? We know that the annulus of the disc is neutral and the nucleus is negatively charged. P. Acnes is negatively charged. We know that other factors like pH can effect charge. Amoxicillin is positively charged and has been specifically used in studies regarding this “debilitating condition”. So, the 15 authors of the 2018 study above conclude, “Positively charged antibiotics appear more appropriate for future studies investigating potential options for the treatment of low-virulence disc infections.” In case you were wondering why it takes so long to make progress. A 2018 study in the journal Scientific Reports found a strong association between Modic change and vertebral endplate defects in the general population. After examining over 8,000 endplates from 831 twin volunteers. The authors indicate supporting evidence for endplate defects as an initiating factor in Modic changes and disc degeneration. The evidence supports the hypothesis, however; we know that endplates are stronger as you move caudally down the spine. So, endplates at L1-2 are weaker than at L4/5. We know that Schmorl’s nodes, most prevalent in the upper lumbar region, do not necessarily lead to Modic changes in the vertebrae; sometimes around the node itself. We also know that the wider the disc, the weaker resistance to torsional forces. Therefore, Modic changes, being more prevalent in the lower lumbar region, may perhaps be better hypothesized as being initiated from the disc itself; tears and/or herniations. A 2018 study in the Journal of Pain Research found that neck pain symptoms were more likely to be found after disc surgery and fusion in those diagnosed with Modic changes. This along with segmental kyphosis or loss of the normal relationship between the spinal segments are considered risk factors for ongoing axial pain after surgery. A 2018 study in PLoS One indicates the possibility that P. acnes activates pain receptors by secreting toxic proteins called hemolysins which target and disrupt nerve cell membranes. The authors indicate postulate this may be involved on some level in symptoms and also the pathological process of chronic low back pain associated with P. acnes disc infections. A 2018 study in The Spine Journal suggests that Modic type 1 changes result from an autoimmune response in combination with other inflammatory factors. The authors indicate that the autoimmune response is due to contact between the nucleus pulposus cells of the disc with bone marrow cells. They indicate this process cannot trigger Modic changes without additional inflammatory stimulus and requires end plate defects that permit contact between the cells in addition to an adjacent inflammatory Modic changed disc, which amplifies the immune response. A 2018 study in the American Journal of Neuroradiology found an association between Propionibacterium acnes in the discs of the cervical spine and Modic type I changes. A 2018 study in the European Spine Journal suggests the lumbar Modic changes come first, then the P. acnes causes problems due to it’s metabolites inflammatory response to disc and bone marrow cells. This indicates that the infection exacerbates an existing Modic changed disc. A 2018 study in the Journal of Spine Surgery confirms DWMRI can differentiate between type I changes due to degeneration (claw sign) and type I changes due to infection (no claw sign). No excuse for future studies to not use DWMRI in patient selection and evaluation. Failure to do so will result in questionable findings and a failure to differentiate between infectious or non-infectious cause. Obviously, there is no reason to use antibiotics for strictly mechanical causes. A 2019 study in World Neurosurgery found by MRI evaluation that only the extent of Modic I changes were associated with pain severity and significantly associated with disability, whereas findings such as disc height, number of Schmorl’s nodes, Pfirrmann graded disc degeneration, and cross sectional area of lumbar muscles were not. A 2019 study in the Journal of Orthopaedic Science evaluated cervical spine Modic changes over a 20 year period. Type II was the most common, followed by Type I, then Type III. The most affected segment was C5/6 and was associated with disc protrusion and neck pain. There was an association with disc degeneration and neck pain, however, the authors found no correlation with arm pain or numbness, shoulder stiffness, age, BMI or smoking. This is all fascinating information and great studies. However, where are the practical implications for symptoms, diagnosis and treatment? Do we just continue researching the biochemistry? From what I see; we have antibiotic therapy documented through Dr. Albert’s work – I see nothing to refute her work or results since her double blind study, and I do not see further clinical trials and studies published by other authors using this method, which is very curious at least. With the advent of DWMRI differentiation regarding infection vs mechanical, patient selection can be significantly improved. We have biologicals (certolizumab, etanercept, adalimumab, infliximab…) which have some positive documented therapeutic evidence. Certainly, there are more risky side effects associated with these drugs, however, it is either an alternative or first choice depending on patient factors. And we have surgery, which indicates the alleviation by removing the problem and/or fixating instability. There is another option, do nothing! Just wait, eventually it will change to a more stable and sclerotic type III. Forget about the costs to society in terms of human suffering and lost productivity. A 2019 study in the Journal of Medical Genetics identified a genetic correlation with Modic changes in an intron of the PTPRD gene that may act via the development of cartilage or nervous system. The authors indicated Modic change as a distinct phenotype of disc degeneration presenting as a pathological marrow signal change on MRI. They noted a strong association with back pain with a heritability of about 30%. A 2019 study in the European Spine Journal used weight bearing MRI to indicate the areas of Modic I change increased with standing compared to lying down face up, and that this change significantly correlated with increased pain in the standing position. There was moderate correlation between lower disc height and increased area of change, and very low correlation between increased area of change and the grade level of disc degeneration. So we have a distinct picture that I have postulated from the very beginning of this article: Type I Modic changes are a specific disease process associated with spinal pain and inflammation that are less responsive to treatments, associated with poor healing, recurring and long lasting disc herniations. Modic I changes represent a rapid, unstable, destructive type of spinal degeneration with a significant percentage associated with a low virulent bacterial infection.